Well that was easy. And I never thought I’d be saying that about baking, at least not so soon. But I just added pizza dough to my “make at home, never bother to buy pre-made again” list. After trying three highly-praised recipes with ease and success, I’ve concluded that pizza dough at home is just one of those good things in life. Surprisingly simple, delicious and rewarding–and quick, if you want it to be. By which I mean that you could wait the hour that, at room temperature, the instant yeast takes to work its magic in pizza dough, or you could cover your dough, set it in the fridge for a day or even two and let it ferment for much longer, which some say is the trick–or one of them and I’ll get to the rest in a second–to better pizza. My best results came from that longer rise and rest too, so I will try to have the foresight to make my dough the day before I want pizza. But since same-day pizza is fantastic too, I’m really not going to sweat it. A word about flour. It’s argued that ’00’ flour is the best flour for pizza, and when I tested Jamie Oliver’s recipe, it was the preferred flour. I’ve tried ’00’ flour on separate occasions with both short and overnight rise times and each time I found the dough it produces is the most difficult to work with. However, it is a wonderful dough once baked, tasty with a beautifully chew even after very long bake times. I have heard the that ’00’ flour we get here is different in protein content than the one found in Europe, and even though I used an Italian brand with so little English on the packaging that I could swear it was the real deal, maybe that was the problem. In the end, my go-to pizza dough will be made with bread flour, which resulted in a dough that rose perfectly, was easy to work with, and yielded the crispiest crust with edges that were light and shattered pleasantly. You can use all-purpose flour as well. But, on the occasions, should you have them, where your pizza dough does not want to cooperate and resists stretching out and being shaped, the best thing to do is walk away. For about 10 minutes. When you come back to it, you’ll probably find that it’s easier to work with once it’s relaxed. It won’t hurt that you’ll probably come back more relaxed too. …as you may have heard many expound: high, high heat. Like the kind you get when you build a pizza oven in your backyard, or push the limits of your oven heat to the point where you void the warranty on your expensive oven (caution!) Since I’m only here now to share what I learned about producing great dough, not the end pizza, I will leave it at this: I am lucky to have a pretty serious oven that can I can push well past 500 degrees, and that I finally, for the first time, used the convection feature when I made my last pizzas. I also lined mine with Terra-cotta bricks in my attempt to mimic a brick oven, and if you can or care to do the same, great. If not, no worries. 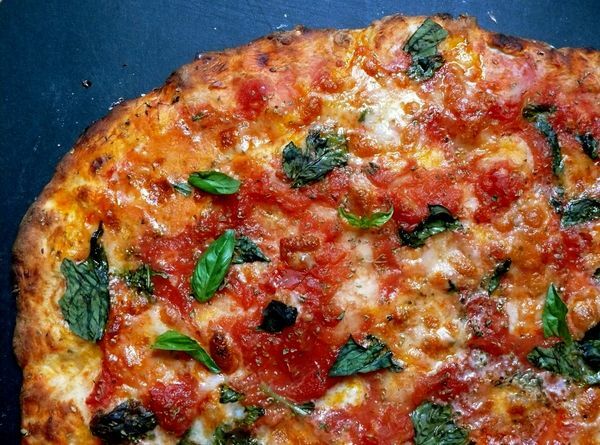 Your dough will be delicious even if your pizza takes twice as long to cook. Back to the most important thing, which is that with the recipe here and the notes on flour, rise times and working with the dough, I assure you, you won’t break a sweat making pizza dough even if baking intimidates you as much as it does me. Until, of course, you’re reaching deep into your very own outdoor pizza oven to retrieve it. Wait–before we get to my favourite dough recipe, remember that this is the third installment of the le sauce baking academy! Which means I/we still have much more to learn about perfecting pizza dough and I need to hear from you. If you have tips to share, please do so in the comments here and please link to recipes or trials on your own blog too so we can all check them out. On the first Tuesday of next month (July 5), I’ll have tested some new recipes, based on your advice and also because I need to explore whole wheat recipes (maybe spelt pizza for instance?) so please let me know if you have any learning to share with me before then. Thanks! In a medium bowl, stir together the flour, yeast, salt and sugar. Add the water and using a wooden spoon or your hand, mix until blended, at least 30 seconds. Oil a clean, large bowl and transfer the dough to it, cover and let sit at room temperature until the dough has more than doubled in volume, about 2 hours. If making only one pizza, use a dough cutter to slice the dough in half and transfer one half to an oiled, sealable plastic bag where it can keep in the fridge for a day or in the freezer for up to 1 month if properly sealed. Otherwise, oil two 13X18 inch rimmed baking sheets. Use a bowl scraper or a rubber spatula to scrape half the dough onto an oiled pan in one piece. Gently pull and stretch the dough across the surface of the pan, and use your hands to press it evenly out to the edges. Oil your hands slightly if the dough sticks to them, and pinch any holes together that may form in the dough. Repeat with the second piece and top your pizza as you’d like. In my very hot oven 525 degrees, plus bricks, plus convection, my thin pizza took about 20 minutes to cook. The crust was perfectly done, not at all soggy. The edges positively shattered. Enjoy! Makes enough dough for 2 thin 13X18 inch pizzas. i am always looking for a good homemade pizza crust. i will have to try this. i think youll love it–please report back! thanks, tonya! i just checked out that recipe and left a comment. did the dough snap back or was it ok on subsequent attempts? Here’s the recipe I use for pizza dough whenever Ally and I make one. I’ve tried a few other ones, and always come back to this tried and true favorite. In a bowl combine 2 cups flour, semolina, and salt. Set aside. In another bowl dissolve yeast and sugar in warm water. Let sit until foamy, about 5 to 10 minutes. Stir the yeast mixture into the flour mixture. Form into a ball. Remove from bowl and knead until smooth and elastic, about 7 to 8 minutes, adding more flour if dough is sticky. I use my KitchenAid stand mixer with a dough hook on speed 2. Put the ball of dough in an oiled bowl and cover with a dish towel. Store dough in a warm place (I boil a medium sauce pot of water and place it underneath the bowl in the oven with the light on – makes a homemade dough proofer) until it doubles in volume, about 30 to 40 minutes. Punch down dough. I usually remove about 1/4 of the dough to make garlic fingers, and use the rest for the pizza. Top the pizza dough with whatever you like (I like pepperoni, salami, and ham with fresh green and red peppers, white onion, and cremini mushrooms – sometimes I’ll dice up some banana peppers and scatter them around as well). Bake pizza on a stone or vented pizza pan at 425F until crust is golden brown and crisp, about 15 to 20 minutes.